Collection of newspaper issues concerning the UN Partition Plan for Palestine. Palestine and Europe, November-December 1947 (most issues were printed on November 30, 1947, one day after the Partition Plan was adopted). Hebrew and Yiddish. 1-4. Four issues of "Kol Ha-Am" newspaper, official paper of the communist party. Issues nos. 237-240, 26-30.11.1947. 5-6. 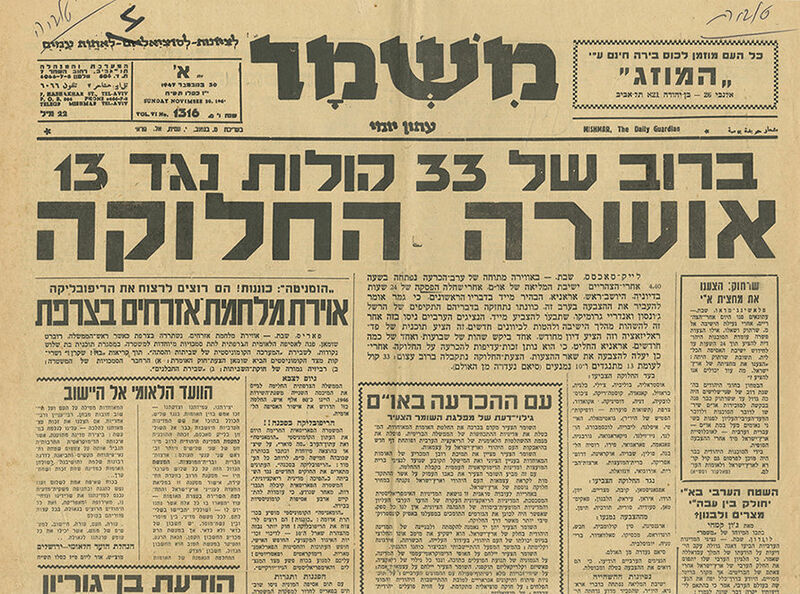 Issue of "HaAretz", 30.11.1947. Headline: "It was decided to establish a Jewish State". Enclosed is a single leaf – special edition of "HaAretz" newspaper, following the UN resolution. 7-8. Two issues of "Yediot Achronot" newspaper from 30.11.1947. First edition and second edition. 9-10. Two issues of "Davar" newspaper from 30.11.1947: issue no. 6802; headline: "Jewish State was Established", and a "Special Edition" issue, headline: "Executive Committee of the United Nations will Meet in Tel-Aviv". 11. Issue of "HaMashkif, National Daily Paper" from 30.11.1947. Headline: "It was Decided that Palestine will be Divided". 12. Issue of "Mishmar", from 30.11.1947. Headline: "33 Votes to 13 in favor of the Partition Plan". 13. Issue of "HaZofeh" from 30.11.1947. Headline: "The United Nations Approved the Establishment of a Jewish State – 33 Votes Against 13". 14. Issue of "HaBoker" from 30.11.1947. Headline: "Jewish State was Approved". 15. Issue of "Dos Yiddishe Vort". Munich, 12.12.1947. Yiddish and Hebrew. A newspaper published in Germany, on behalf of "Agudat Israel", for She'erit Hapletah. The paper reported news, updates from "Agudat Israel" chapters worldwide, and more. On the first page of the paper appear updates about the UN resolution. 16. Issue of "Di Tzionistishe Shtime" [The Zionist Voice], published by the European office of "HaZionim HaKlalyim", 3.12.1947. Yiddish. A special edition; headline: "Zol lebn di idishe medine! Zol lebn dos idishe folk!" [Long live the Jewish State! Long live the Jewish People!]. The issue is lacking at the end. Enclosed: Single leaf from the newspaper "Ashmoret" from 4.12.1947. On this leaf appear photographs of the celebrations in the country, and the headlines of newspapers of the same day. Total of 16 issues. Size and condition vary. Good overall condition. Tears, some slightly affecting text, some reinforced with adhesive tape. A piece is cut out from the last page of "HaBoker". Stains. Some pen inscriptions, folds and folding marks. The issue of "Di Tzionistishe Shtime" is incomplete (missing pages at the end).